Re-Qualification Home Study course for professionals to Re-Qualify for Advanced Qualification as a Cancer Exercise Specialist. 4 Modules & Testing Included. Pilates & Yoga Handbooks, plus 1 Year MedFit Network membership and 2 year CETI CES listing included ($300+ Value). Hard copies available upon request, pay only $22 additional shipping fee (US delivery only). The renewal package is available to professionals who have previously purchased the Cancer Exercise Specialist® Advanced Qualification training and would like to obtain Qualification for another 2 year period. 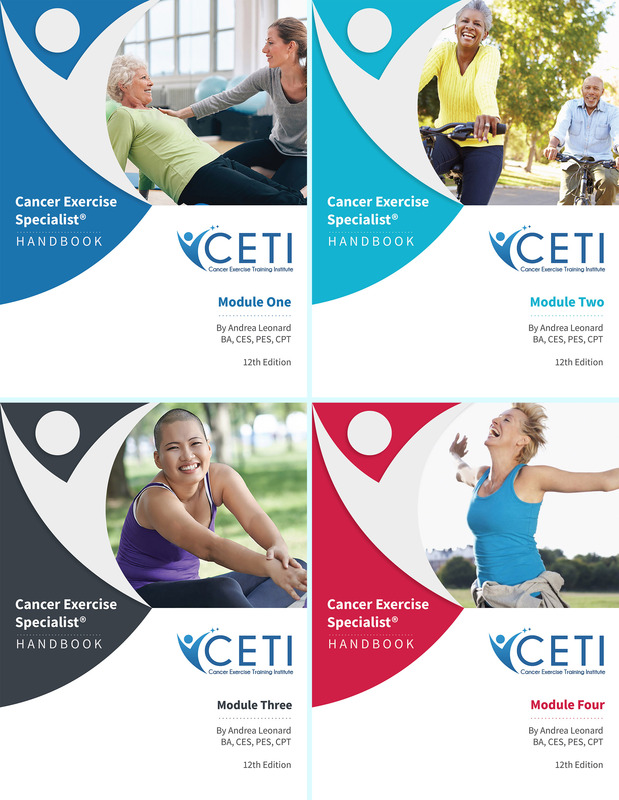 The Cancer Exercise Specialist® Advanced Qualification is developed for health and fitness professionals seeking to attain a higher level of mastery and work with cancer patients during and after cancer surgery and treatment and into survivorship. The CES homestudy course allows participants to gain a complete understanding of the entire cancer process from diagnosis and treatment to reconstruction and survivorship. Our unique and individualized programming will help to improve the patient’s ability to cope with the mental and physical stress following cancer diagnosis and treatment. The CES homestudy course covers 26 types of cancer, as well as pediatrics, with special emphasis on breast cancer and breast reconstruction. The Cancer Exercise Training Institute has trained more health and fitness professionals worldwide to become Cancer Exercise Specialists than any other organization. Andrea Leonard, 35-year cancer survivor, PFP 2019 Personal Trainer of the Years, author of “Essential Exercises for Breast Cancer Survivors,” ACE Certified Personal Trainer, NASM Corrective Exercise Specialist and Performance Enhancement Specialist, and President/Founder of the Cancer Exercise Training Institute began her extensive research in 1995; long before anyone had ever hear of “cancer exercise.” She spent three years working on Essential Exercises with the chiefs of breast surgery at Georgetown, George Washington, and Johns’ Hopkins University Hospital Medical Centers. Realizing there was a need to assist patients with many types of cancer, Andrea expanded her research and writing to cover a broader spectrum. She is truly a pioneer in the field of cancer and exercise and has paved the way for other organizations to follow.